Other Half out of New York recently celebrated their 2nd anniversary and as such, they brewed a special beer to commemorate the occasion. It's a massive 9% DIPA brewed with familiar hops like Citra and Galaxy, but also new hops to me such as Kohatu and Wai-iti. 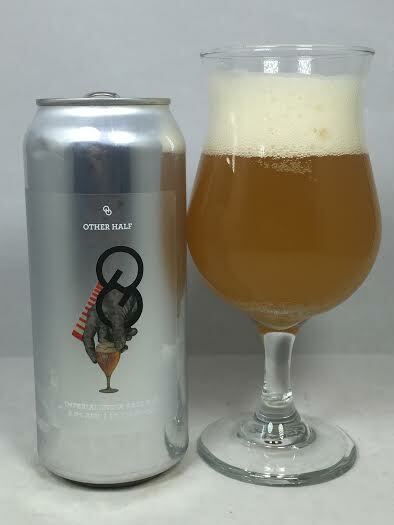 If you know me, then you know that Other Half has yet to blow me away, so I'm really hoping that they brought their A-game with such a special beer. Pours a nice hazy orange with almost three fingers of pure white head. Spicy hops on the aroma with a little bit of orange and mango. Also getting something similar to rye and a dry malt. Believe it or not, I get a big kick of pine right up front. The pine isn't as big as some IPA's from New England, but rather it is more like dry pine needles. In the middle of the mouth it's noticeably bitter with a dank hop bite which is even a little acidic. This owes more to the West Coast as raw garlic and onion are quickly flooding my palate leaving me searching for some citrus to even things out. As for that citrus, I really don't detect any influence from the Citra or the Mosaic, but whatever malt their using is taking over the finish as this has a doughy and dry taste/aftertaste. Like the finish, the feel is considerably dry and almost powdery or doughy with a remarkably light body for a 9% DIPA. While the hops were acidic, they didn't feel syrupy or resinous at any point in time and there was no alcohol to be found. Some of those garlic/onion flavors linger for a few seconds after each swallow which isn't ideal. While this was by no stretch of the imagination a bad beer, I really wish Other Half would have stepped it up for a 2nd anniversary beer. Given the hops used, I was expecting a juice bomb of an IPA, but this tasted similar to a lot of the other Other Half beers I have previously reviewed. Like the others, this had a West Coast vibe to it and left the mouth dry. At the end of the day, I am still searching for the hype.